Just when I thought I’d sorted out what I’d be doing for the next few weeks, along comes the delivery of linen scrim, and within no time at all, I’m diverted off on to another track. I wanted to try the scrim, because although I adore the variable, loose weave of the hessian that I’ve been using, it is hairy and I think gives me a few issues with sneezing and sore hands. Linen scrim seemed to be a useful alternative. I quickly set up a piece on the 17″ frame – it felt as if it needed a frame – and put needle to the canvas. 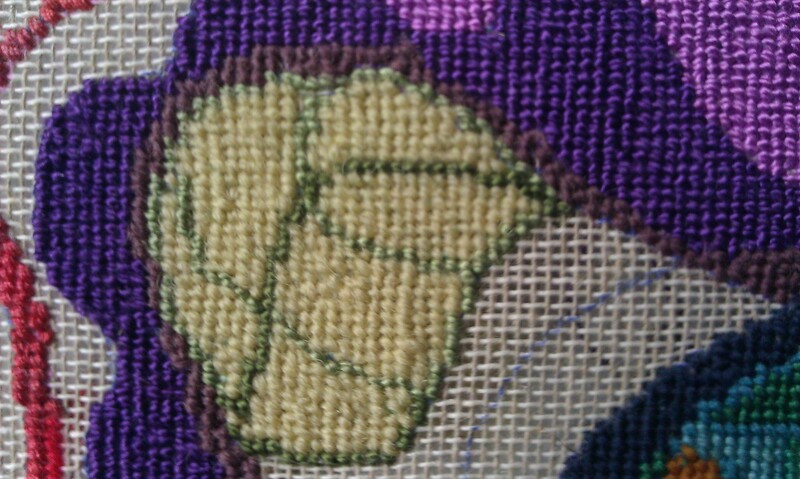 The first thing that struck me, was that this scrim is going to take a lot of stitching – sooooo many stitches! (I estimate about 20 stitches per linear inch – 400 per square inch). I’m not afraid of working large or slow pieces, but this felt a touch daunting. But once I’d experimented with different strands of wool/silk/cotton, I found I’d somehow become attached to it. I had originally thought I’d just do a few square inches to see how it worked, but now I’m sure I’ll carry on with it. 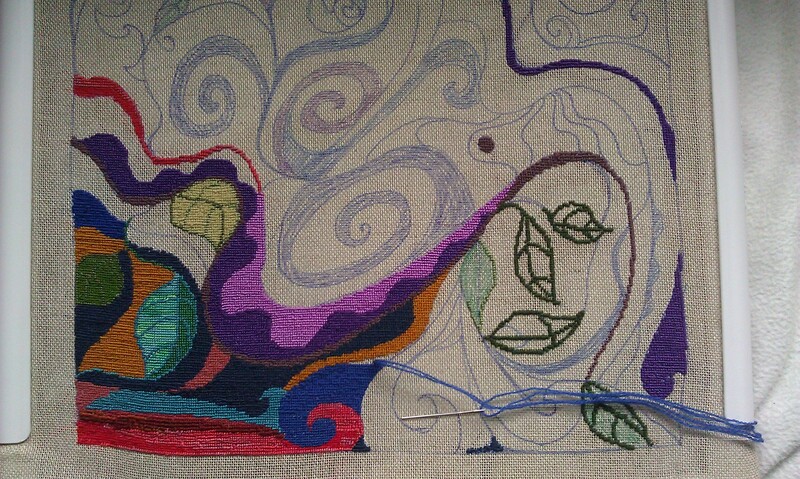 As with the hessian, I find that the softer canvas feels attractive to work on. On the plus side of using the tiny gauge, I now have a good excuse to use some of the yarns I’ve been keeping from Stef Francis and Oliver Twists – yarns that would have been lost on a bigger gauge piece. I’ve also tried out some Anchor Perle cotton. 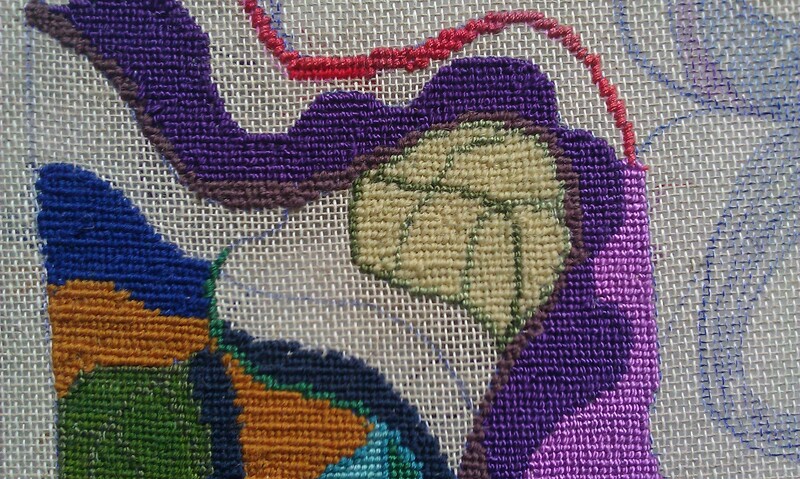 It fascinates me how each different type of thread lies down in the canvas with its particular character. So, a delay on progressing the stonework idea – but a bit of an education going on instead.